Garden Accessories Tools is an online business platform for manufacturers, suppliers and wholesalers of gardening accessories and tools. You can browse through comprehensive collection of garden decoratives, garden lightening, garden sculpture and much more. Moreover, the portal aims to keep the visitors abreast of the latest trends and innovations with new articles and updates from the industry. Browse through an extensive collection of garden decoratives available in variety of attractive designs, shapes and sizes. From bird bath to garden gates and from gongs to garden statues, you can get the complete details of each product in our catalog. Create a magical outdoor setting with an exclusive collection of decorative garden accessories. You can find a right pick from an extensive range categorized on the basis of materials. Gardening tools are essential for maintaining the bloom of the garden with absolute ease and maximum protection. 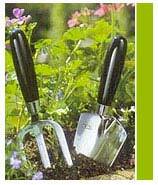 You can browse through a wide range of garden tools available for both professional and nouveau gardeners.